Carwash machines offer a much needed service to car owners all over the country. Being able to simply drive into one of these car wash machines and quickly and easily wash your car with their car wash tools is what makes these machines so popular. By updating your machines on a regular basis, you can help to keep the popularity at a high level to make a bigger profit and keep your customers happy. Whether you are simply updating your carwash equipment and bays or installing a complete system, you will find exactly what you need. These carwash machines use ceiling booms that include wands and brushes that allow you to clean your car easily and quickly. The ceiling booms can move back and forth to allow a customer to clean their car from hood to trunk easily and quickly. By taking the different components that are available and arranging them according to your needs, you can create the right car wash for your needs and those of your customers. By combining the wands with the right accessories, your customers will be able to get their car, truck, or other vehicle clean and shiny. Carwash supplies and accessories can give your customers the added tools to get their vehicle clean and free from dirt and debris. From brushes to bent wands to straight wands, the right accessories will make your carwash machines more efficient. This can increase the value and enjoyment for your customers that are cleaning their vehicles and, since it is a business, you will find that having an efficient car wash machine will keep the customers coming back time and time again. Both ceiling and wall booms are available to create a car wash that will work efficiently and completely. From a single boom bay package to a triple boom bay package, you will have the car wash machines that you need to make your car wash business successful. You can create the business that you want by purchasing the carwash system to fit your bays and your business. A successful business can be yours with these car wash machine packages. 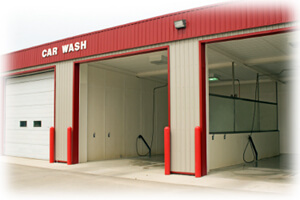 Carwash machines allow the customers to use the wands to clean the areas that need to be cleaned. Sometimes, a car needs special detailing due to mud and/or dirt and by having a wand; your customer can concentrate high pressure water to get their car completely clean and free from dirt and debris. By installing the carwash equipment in your car wash bay, you will be ready to let the customers use the car wash machines to clean their cars, trucks, and vans. Car wash systems need to be easy to use and efficient. These car wash packages that are offered here are sure to fit those needs to give your business the step up that it needs. From high quality equipment to different sizes and setups, you will find that the carwash machines offered here will help to make your car wash bays work efficiently for your customers for years to come.